Ever since man set foot on planet earth, he has been a seeker. As he evolved, his thirst to understand the mysteries of life aroused and grew. His experiences forced him to ask questions for which he could find no answers. This search gave rise to many different schools of philosophy. All of them point to a source within. India has a very rich inheritance in the fields of philosophical reflection and spiritual inquiry, with a great variety of beliefs and practices. But they all share the idea that we should undertake a special journey towards an inner light. T Krishnamacharya is recognized as one of the greatest masters of the last century, an authority on all schools of Indian thought and an expert in the fields of yoga. Combining an ocean of knowledge with his vast experience stretching over more than a century, he taught his students to connect with their heart. 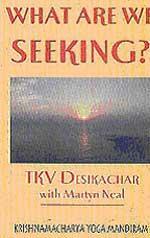 His son and student, TKV Desikachar, offers in this book a synthesis of three decades of study and a wealth of experience in teaching worldwide. The reader will discover many aspects related to the inner quest: the role of suffering, appropriate discipline, the student-teacher relationship, social responsibility and values, the mind, action, faith. Desikachar, as one of today's foremost exponents of this ancient discipline, presents in a lucid and intuitive manner the best of Indian Wisdom.